The Hermes Experiment presents a programme of new music inspired by visual stimuli at The Forge, in Camden on Tuesday 16 February 2016. The programme includes new commissions from Kate Whitley and from British-Iranian composer Soosan Lolavar which will respond to a visual element. There are graphic scores and a new animation by Izabela Barszcz using Black Sea by Ed Scolding, a Hermes Experiment commission premiered in 2014 which you can hear on Ed Scolding's SoundCloud page. 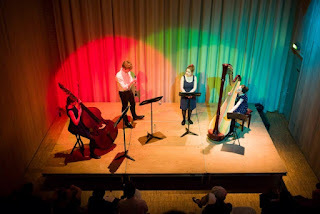 The Hermes Experiment is an ensemble of harp (Anne Denholm), clarinet (Oliver Pashley), soprano (Héloïse Werner) and double bass (Marianne Schofield) which makes contemporary music, new commissions and improvisation the focus of their programme. The group was founded in 2013 and since then they have commissioned works from 28 composers and will have a residency at Aldeburgh in Autumn 2016. Further information and tickets from The Forge website.